We all like French fries, who are we trying to kid, but sometimes it is nice to mix it up a bit, and maybe be a bit healthier. Sure, we miss the days when we could go through the drive-thru and eat our favorite fast food fries, but really, homemade is so much tastier. These are baked and not fried. If you have never had a parsnip before, think a carrot on steroids. They are a root vegetable, and located near the carrots or the turnips in the produce section. They look like a bigger carrot, but they are white, and a little tougher to cut. They have a nice sweet, earthly flavor. 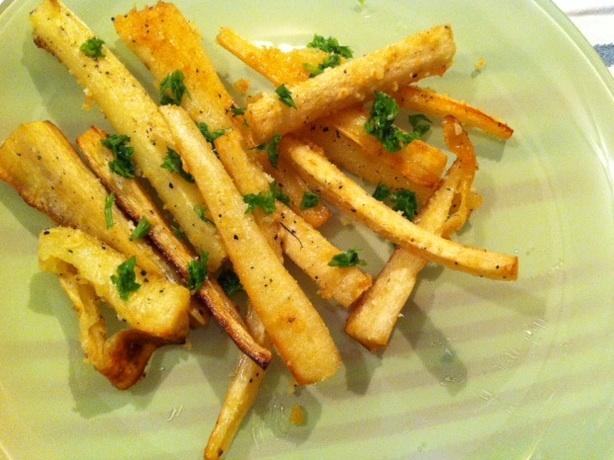 In addition to making parsnip fries, I also like mashing them with some potatoes for some extra pizazz! I use parsley in this version, but feel free to play around, and add whatever you have around or in your garden. You can also leave off the parmesan for a vegan version. These are pretty easy to pull together, and make a great side dish with just about anything. Last night, I served this with our Summery Pea Soup with Fresh Herbs. Eat while warm. You won't even need ketchup! Dunkin' Donuts gluten-free options, yay or nay?